Kirkwood, CA – Kirkwood officials confirmed this afternoon that, conditions permitting, the Sierra resort’s season opening will now take place on Saturday, Nov. 24, rather than the resort’s originally scheduled opening day of Wednesday, Nov. 21. For opening day, Kirkwood is planning to open the Outlaw Run on chair 5 for intermediate skiing and riding only. Rope Tow 8, may also be available for beginners. 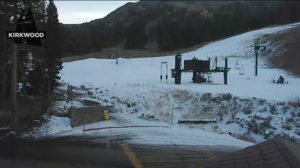 The resort will add lifts and terrain as soon as conditions allow. Passholders will also be treated to free breakfast sandwiches starting at 9 in the morning on Saturday. Also on the schedule for opening day: snack, ski and ride gear giveaways throughout the day. Guests can take a break from the slopes and après in the afternoon with live music in the Kirkwood Village. All retail outlets, on-site lodging and most of the Resort’s restaurants will be open for business serving up drinks and food.